Chalet Sapins is one of the largest in Sainte Foy and it boasts the best facilities. Chalet Sapins (the fir tree) is a luxury alpine lodge built in the local Savoyard architectural style, with traditional pitched roof, large wooden balconies and natural stone fireplace giving it that sought after ‘chocolate box’ ambience . 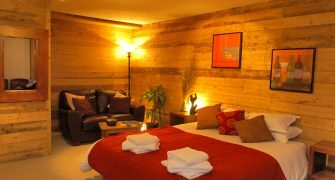 The private Venture Ski spa facilities are located on the ground floor of this magnificent ten bedroom accommodation. This outstanding chalet has eight en-suite double bedrooms and two larger family suites, also en-suite. Chalet Sapins is built on three floors, facing down the Isère valley with clear, stunning views across to Les Arcs and La Rosière. This chalet is perfect for large parties or for smaller groups who enjoy mixing with new company on holiday. With sleeping space for 24 spread over three floors, there is plenty of flexibility to be part of a large group, but with separation and personal space when needed. Each en-suite room has a flat-screen with DVD player plus there is an iPod docking station and WiFi in the lounge area. There is no Satellite or terrestrial television in this chalet; our guests prefer lively conversation, board games (complimentary of course) and family fun. The central lounge and dining area is sumptuously appointed with leather sofas nestling a walk-around log fire. Meals can be taken either for individual couples, groups or as a banquet table for all guests – you choose. Bedroom 1:Chalet Sapins Luxury King Room with en-suite Bath: Spacious King-sized bed format suite with space for additional child’s bed/cot; En-suite with mosaic feature bath & WC; West facing balcony with unspoilt views across the Isere Valley (overall area 22m²). 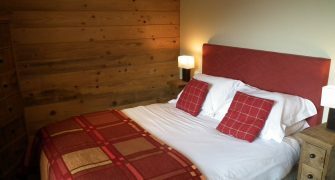 Bedroom 2:Chalet Sapins Exec Twin Room with en-suite Shower: Well-appointed twin bed format (can be joined to super-king size bed); walk-in wet room-style shower, WC en-suite; West facing balcony with views across the Isere Valley (overall area 15m²). Bedroom 3:Chalet Sapins Exec Family 3 Room with en-suite Bath: King-sized bed format and family suite with additional single bed and room for cot; En-suite with free standing bath, WC; Balcony with views across the Venture Ski complex (overall area 18m²). 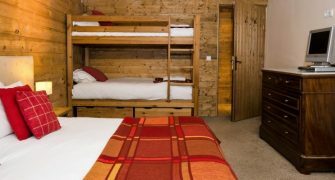 Bedroom 4:Chalet Sapins Exec Family 3 Room with en-suite Bath: Twin bed format & family suite (can be super-king size bed) with ‘cubby hole’ bunk bed and room for cot; En-suite with free standing bath, WC; Balcony with views across the Venture Ski complex (overall area 17m²). 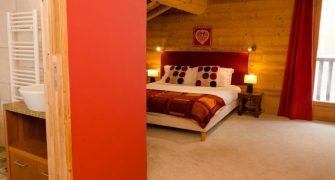 Bedroom 5:Chalet Sapins Exec King Room with en-suite Shower: Generous sized King bed format with additional space for child’s bed/cot; walk-in wet room-style shower, WC en-suite; Balcony with views across the Venture Ski complex (overall area 20m²). Bedroom 6:Chalet Sapins Exec Family 4 Room with en-suite Shower: Twin bed format (can be super-king size bed) with additional bunk bed and additional space for cot if required; Walk-in wet room-style shower, WC en-suite; Balcony with views across the Venture Ski complex (overall area 20m²). Bedroom 7:Chalet Sapins Standard Double Room with en-suite Shower: Ground floor double bed format, walk-in wet room-style shower, WC en-suite; Balcony with views across the Isere Valley (overall area 12m²). Bedroom 8:Chalet Sapins Standard Twin Room with en-suite Shower: Ground floor twin bed format (can be joined to super-king size bed) Walk-in wet room-style shower, WC en-suite (overall area 12m²). Bedroom 9:Chalet Sapins Standard Double Room with en-suite Shower: Ground floor double bed format, walk-in wet room-style shower, WC en-suite; Balcony with views across the Isere Valley (overall area 11m²). Bedroom 10:Chalet Sapins Standard Twin Room with en-suite Shower: Ground floor twin bed format (can be joined to super-king size bed) Walk-in wet room-style shower, WC en-suite. (overall area 11m²). 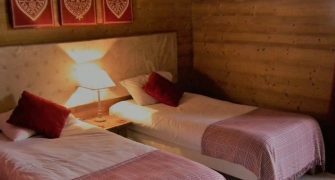 Chalet Sapins boasts a private locker for ski equipment and a boot dryer in the lobby. With all ten bedrooms being en-suite, guests still have their own privacy. This chalet benefits from direct indoor access to the Venture Skispa on the lower floor. The Spa area is equipped with a 10m heated swimming pool, hot tub and sauna and has stunning valley views. In addition there is also a qualified therapist on hand to provide massage services tailored to your individual needs. 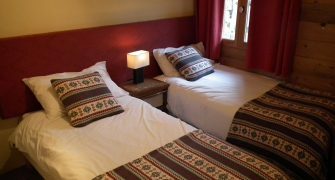 In the peaceful area of La Bataillette; Chalet Sapins is a five minute walk from the resort centre where there are shops, local restaurants and bars, ski schools, nursery slopes, and the main ski lift. Even closer to hand is the Black Diamond restaurant and Apres-ski bar. The chalet is Ski-in at the bottom of the Bataillette Piste, and just a few minutes walk to climb back onto the lift. To make your holiday even easier, there is a free navette ski bus instead of the short walk. The chalet is close to a private creche and childcare facility. Babysitting services are also available.